Upon arrival in Ende Airport, Central Flores, you will be welcome and met by our guide. After baggage claim, our guide will take you to Moni, located on the slope of Mt Kelimutu for about 2.5 hours drive from Ende. Photo stops will be made according to local happenings for the panoramic view and local people activities. Late afternoon arriving in Moni and check in at Kelimutu Eco Lodge for dinner and overnight. Early morning at about 04:00 am drive up to Mt. 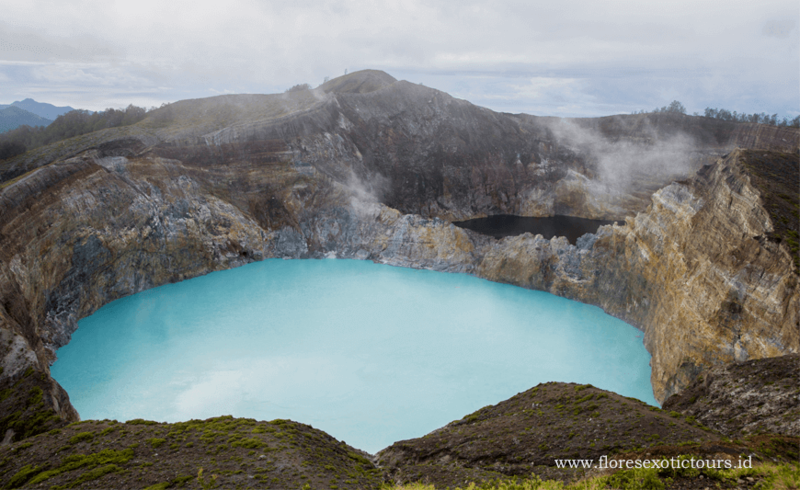 Kelimutu to view its picturesque three color lakes and sunrise over the lakes if the weather permits. Then return to the hotel for breakfast. Then drive back to Ende with stops at Moni traditional market and Wologai traditional village. Lunch will be served in Ende. After lunch transfer to the airport for your flight to Labuan Bajo. On arrival in Labuan Bajo, you will be met by our guide and transfer to your Hotel. Dinner and overnight at Puri Sari Beach Hotel. Departure at 6 am from the hotel, transfer to the harbor, crossed by boat for about 3.5 hours to Komodo island, arrive in Komodo, take a medium trek for about 1 1/2 hours. It passes a waterhole where the Timor deer and wild pigs often come to drink. Sometimes, dragons can be found there lying around and waiting. You will climb Sulphurea Hill and Frigate Hill, where a magnificent view across the islands, bays, and beaches awaits. Return to the boat and proceed to a pink beach. This peculiar beach gets its color from red coral fragments. It is definitely a great place to spend some time by just laying back or enjoying the underwater world with your snorkeling equipment, Afternoon back to Labuan Bajo. Dinner and overnight at Puri Sari Beach Hotel.